Crossing into Germany was so understated that we weren’t even sure if we had crossed a border. 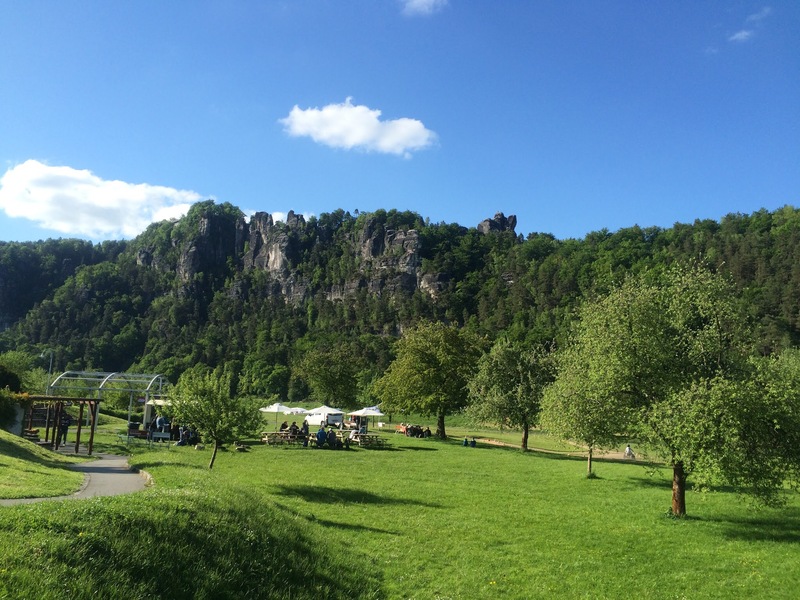 We had been riding along the Elbe river all morning and continued tot do so all afternoon. It’s a beautiful river lined by tall dark trees, just as I had pictured Germany in my head. We soon learned that it was a holiday, again. Herrentag, or man’s day, is one of the more rambunctious holidays of the year and generally consists of groups of men getting together and filling a wagon with beer before walking around all day drinking and singing. We saw some pretty decked out wagons, one even had a dartboard and soundsystem. We met another tourist named Klaus and rode with him in the afternoon to a campsite in Dresden. Because of the coming long weekend the campsite was pretty full but luckily mostly of caravans. The caravans everywhere were really common all through Germany. It seems that half the country is caravaning on any given weekend. 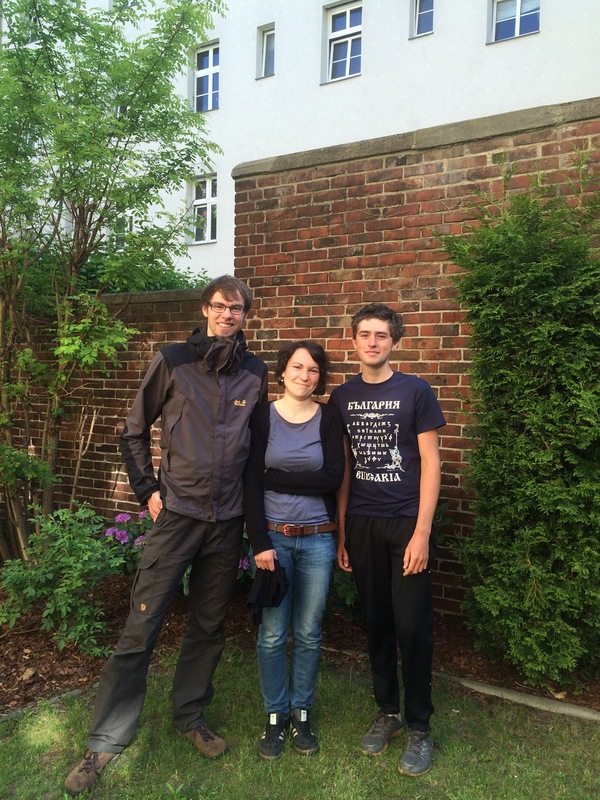 At the campsite we met Enrico and Samantha who were on a weekend tour through Saxony. We got to chatting with them and they invited us to stay with them in Berlin when we got there! 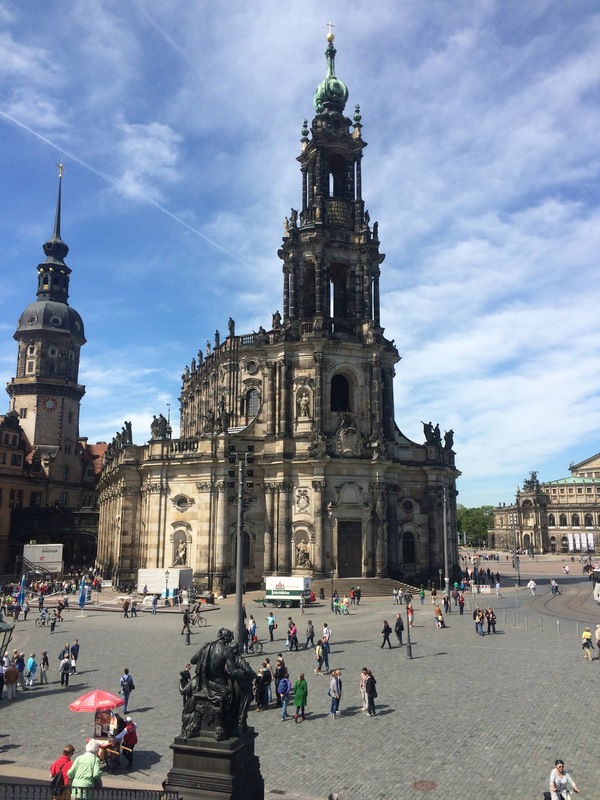 We spent the morning of the next day wandering around Dresden which is a really cute little city. The Altstadt, or Old Town, lies on the southern side of the river. It’s beautiful city which is, unfortunately, mostly reconstructed due to the bombing of the city in the final months of WWII. 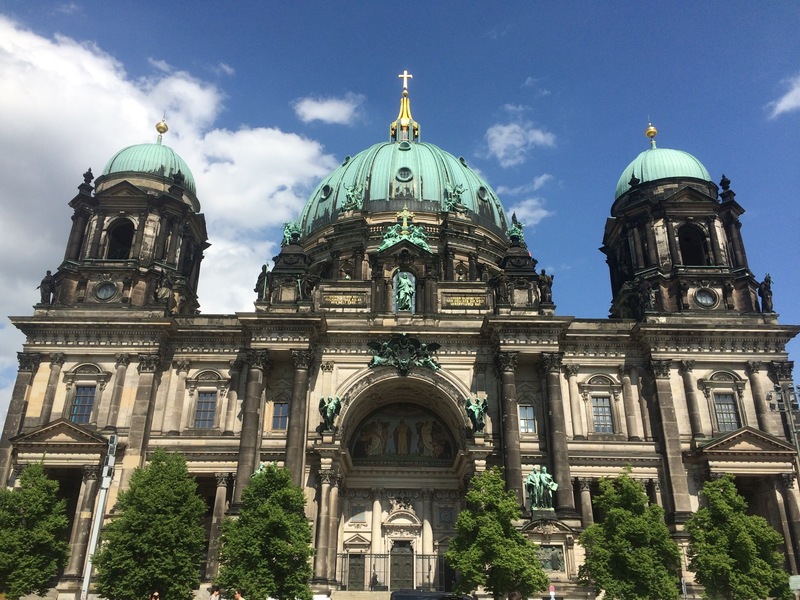 The standouts for me were the Frauenkirche, Dresden Castle, and Zwinger. The Frauenkirche was closed for the afternoon because of some sort of rehearsal, but the outside is still very beautiful. 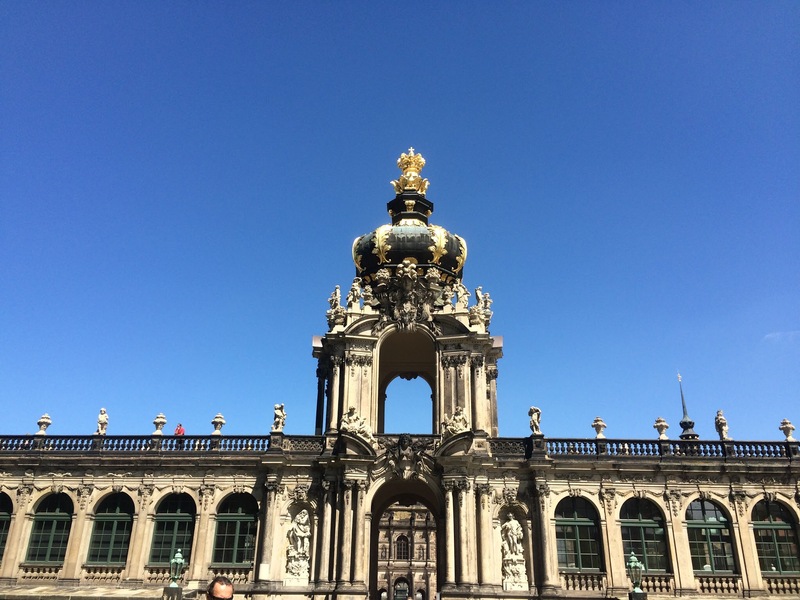 The Dresden Castle is now a museum home to many royal artifacts. We especially wanted to go see the Historic Green Vault which is a Baroque treasure room that was open to the public when it was first built, making it one of Europe’s oldest museums. Unfortunately it is very popular and the tickets were sold out for the whole day when we arrived. The building itself is still stunning and we were able to walk around through the courtyards on the inside. 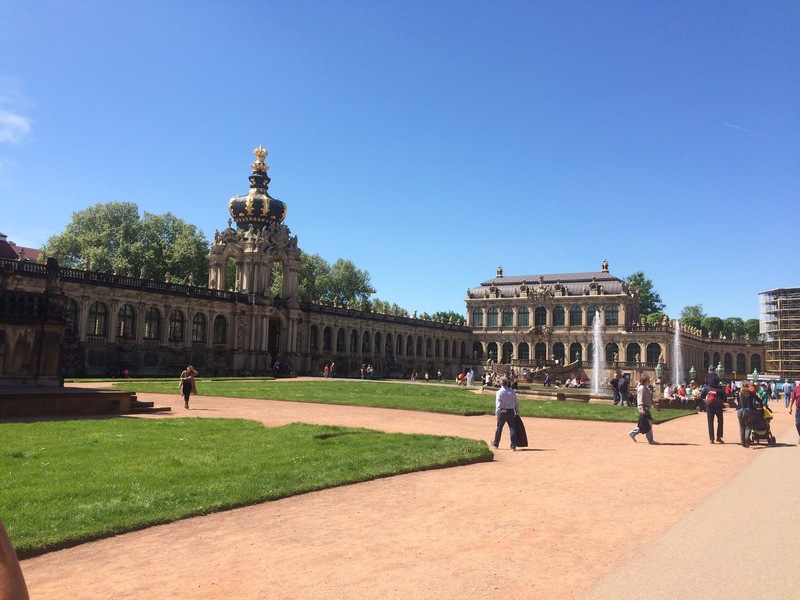 Zwinger was quite cool. The building itself is very ornate and has lots of statues but the garden in the center is the cool part about it. The garden isn’t the biggest we have seen but it was really nice and had some interesting landscaping. We crossed over to the Neustadt, New Town, for the afternoon. It is home to the university and has a very college town feel to it. We spent some time in a nice little cafe working on the blog. Autumn ordered an iced coffee, but as we have found there is always a bit of guessing when it comes to ordering things in another country. Apparently in some places in Germany an ice coffee is actually an ice-cream coffee. 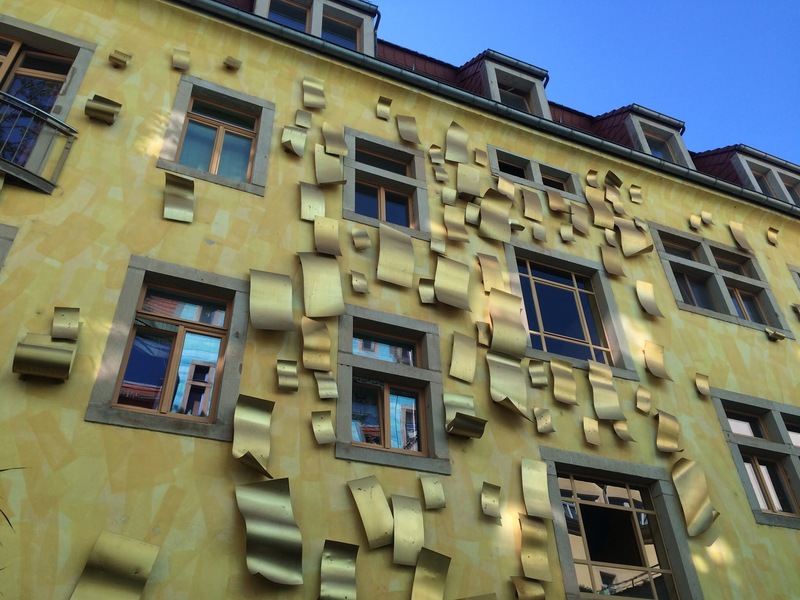 We spent a little while wandering around and checked out Kunstofpassage, an art installation on the way out. We were tipped off by a friend of Autumn’s that it was a must see and it certainly was. The next day was spent continuing north along the Elbe. 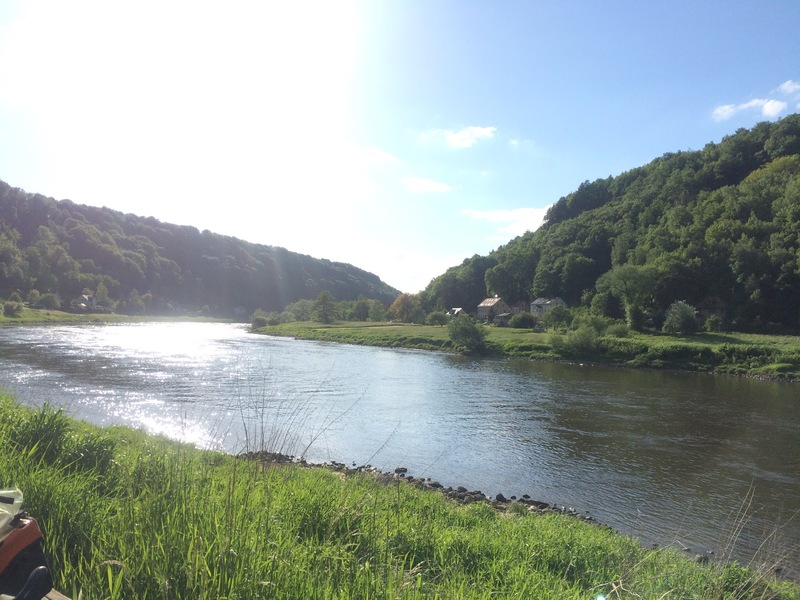 The Elbe is a wide, murky river lined by beautiful trees, green as far as one can see. 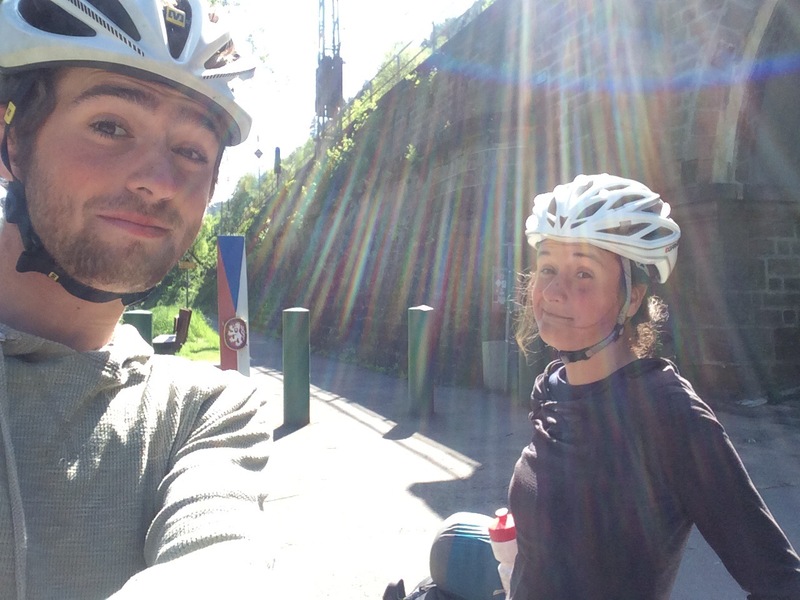 We followed the bike path along the bank, no hills, no cars. It made for a very relaxing day.Eventually we turned away from the river to stay north. We picked up another river and rolled into Bad Liebenwerda just as it started to drizzle. As we searched for a place to camp or even a cheap room for rent with no luck the rain started to pick up a bit. Just when we thought we were going to have to camp in some random field by the train tracks we decided to try one more place and asked some firefighters who were taking down stuff from a festival. 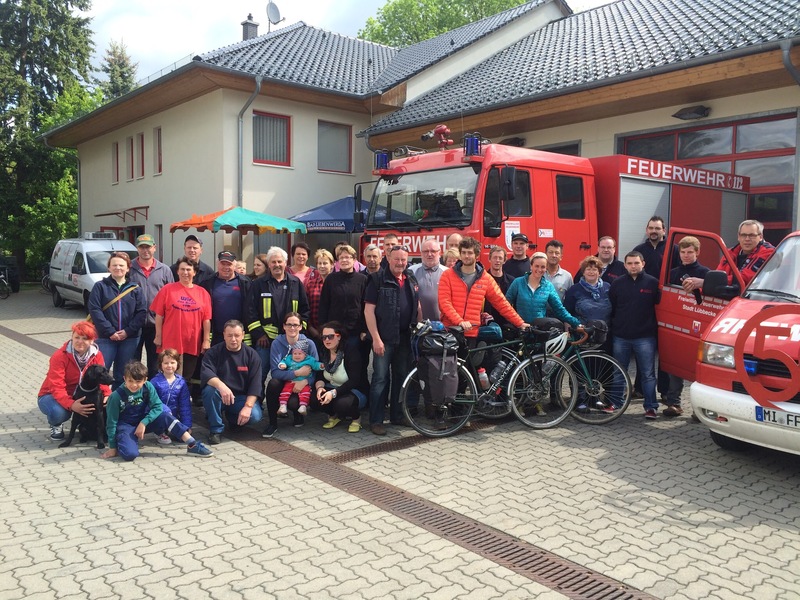 We were quickly invited to the station to sleep and to attend their annual barbecue! We had a great time hanging out with the guys from the station and chatting with Martin who has been a volunteer at the station for 15 years, since he was 11. We even got to go up in the ladder truck 30 meters in the air! The next day was pretty uneventful but more really nice riding. 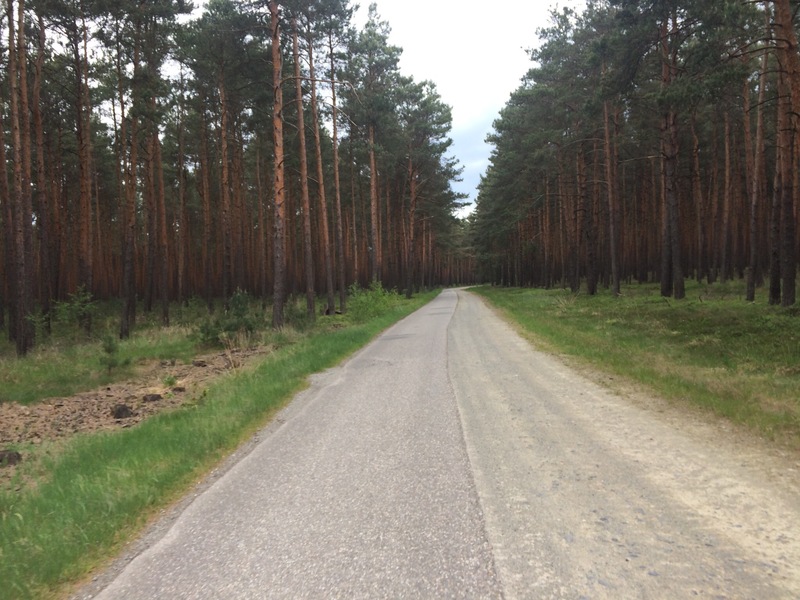 We spent the day in and out of the forests on little bike roads. We rode through at a great time of year, everything was green and just starting to bloom. It’s really nice to just be out in the middle of nowhere between cities and just enjoy the countryside. We enjoyed our last day of really being in the country before heading into Berlin and then on to Western Europe. Ahh we are almost there! 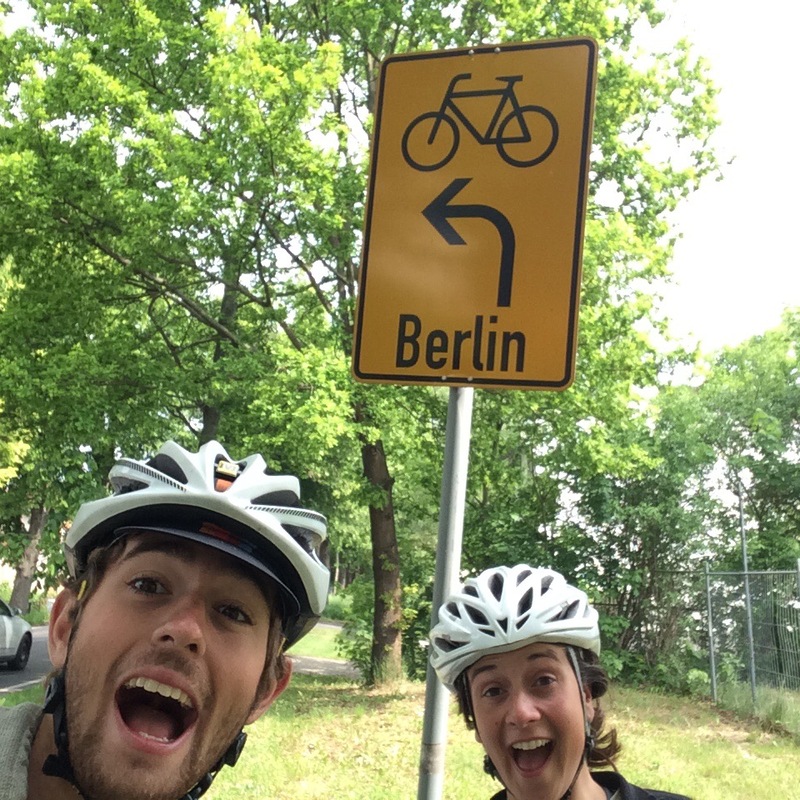 The ride into Berlin was easy considering the massive size of the city. We made our way to our new friends apartment and hung out in another cafe to get a blog post up WOOHOO! One of the first things we noticed as we came into Berlin was the amount of greenspace everywhere. So many parks with big common areas and lots of trees. It makes the city feel a lot less overwhelming and more homey. 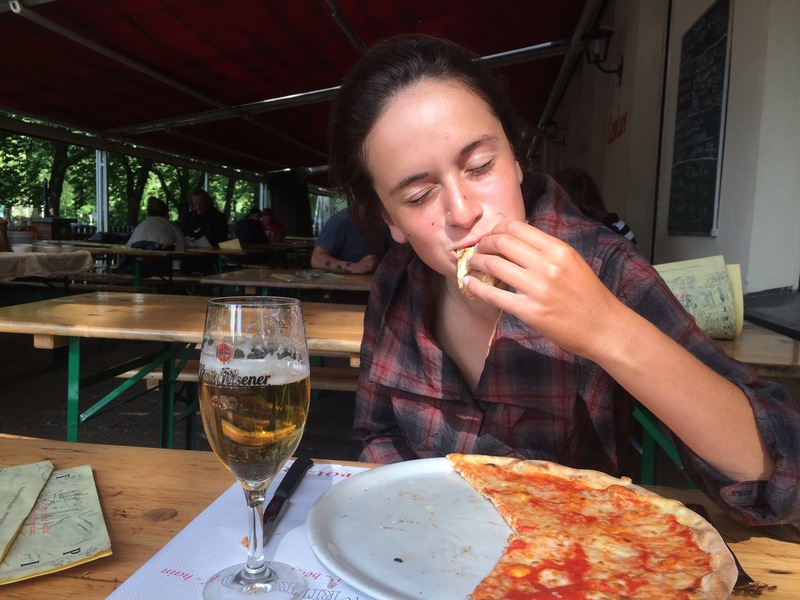 Our first day in Berlin was a bit overwhelming at the start. The city is so big and is divided up into 12 boroughs each with it’s own feel. 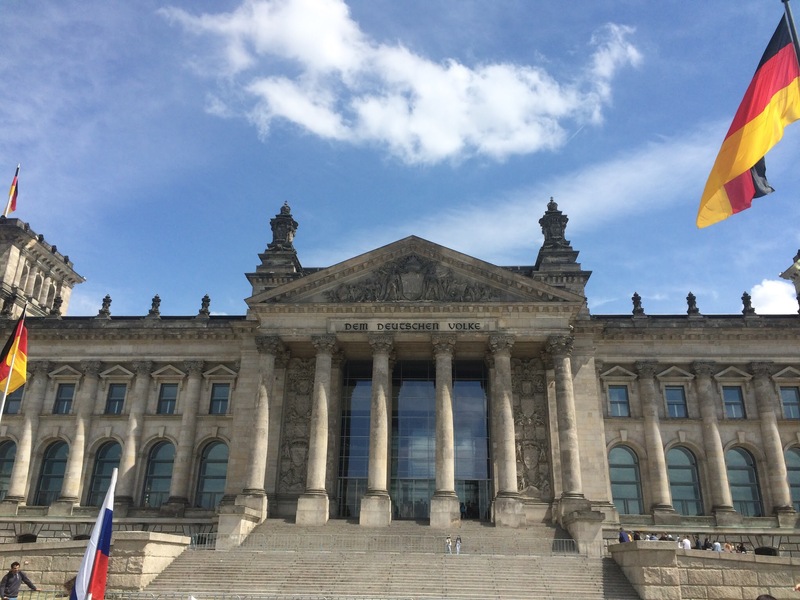 We started our day off in the center (Mitte) to see a few of the most famous landmarks. 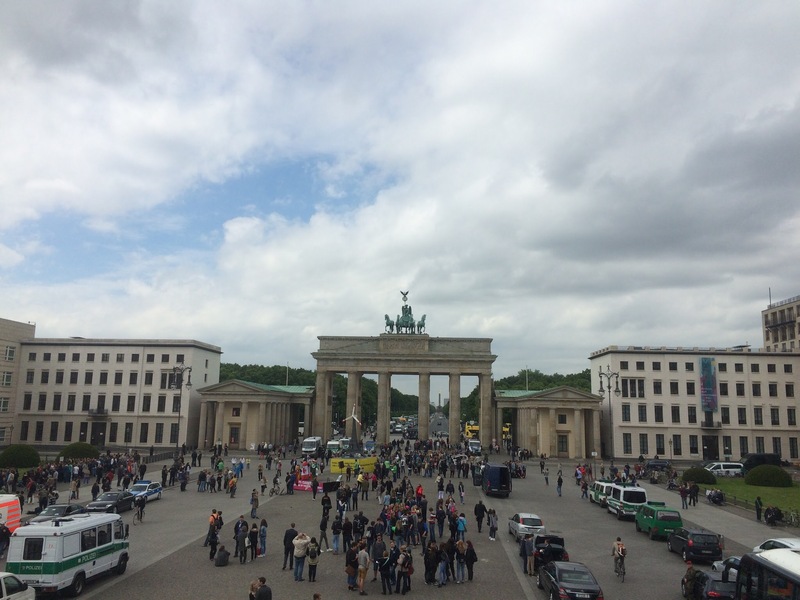 The Brandenburg Tor which is considered the symbol of Berlin is right in the center and we could see the line showing where the wall cut of access to it from the eastern side of the city.We spent a while just wandering around the center admiring the historic buildings. After spending some time in Mitte we caught a train towards Kruezberg and Friedrichshain to see something a bit less touristy. We really liked this area, much less overwhelming and felt like a place where people really lived. I think that one of the nicest parts about living in Berlin has to be all the public greenspace. There were tons of people hanging out with friends by the river or in Volkspark as well as jogging, rollerblading, riding bikes and playing beach volleyball. 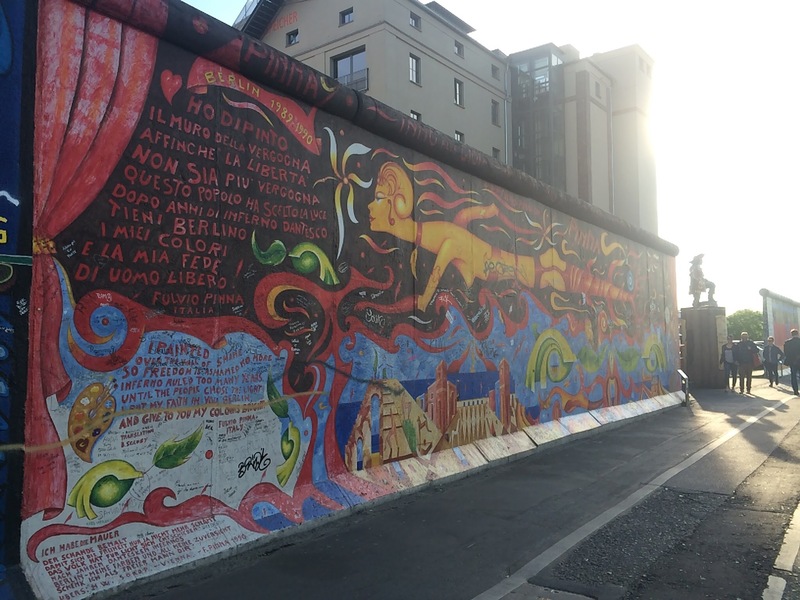 We also went and was the East Side Gallery which is a very cool public art installation on parts of the former wall. A lot of it has been defaced by graffiti which is sad but what remains is really cool. 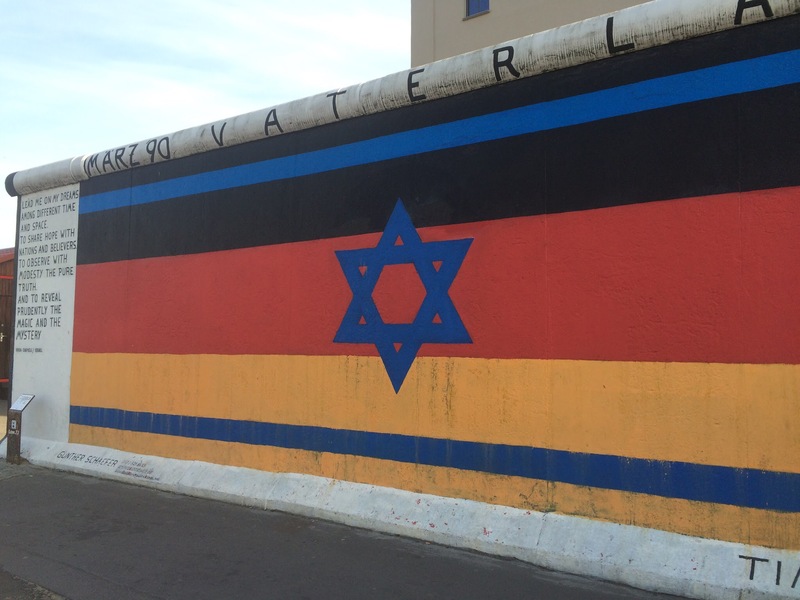 It includes murals by artists from around the world about the period of change and hope following the fall of the wall. 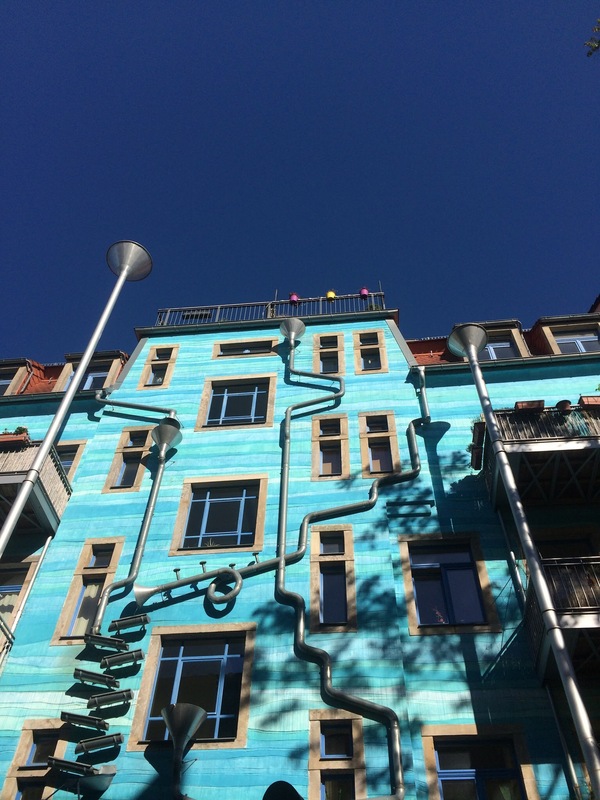 Our next day we revisited Mitte with some specific thing we wanted to see. 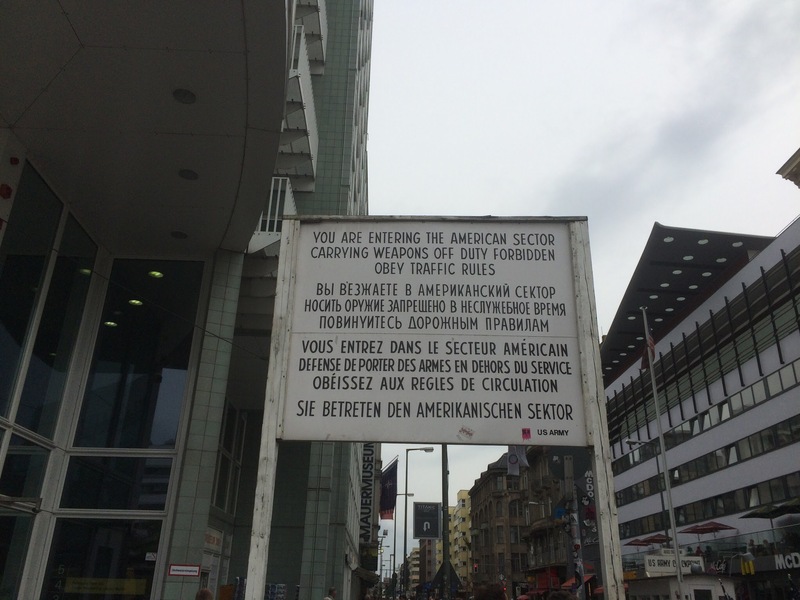 Even though it can be a crazy tourist trap, we had to go see Checkpoint Charlie. This is one of the crossing pints of the wall that was manned by US military. 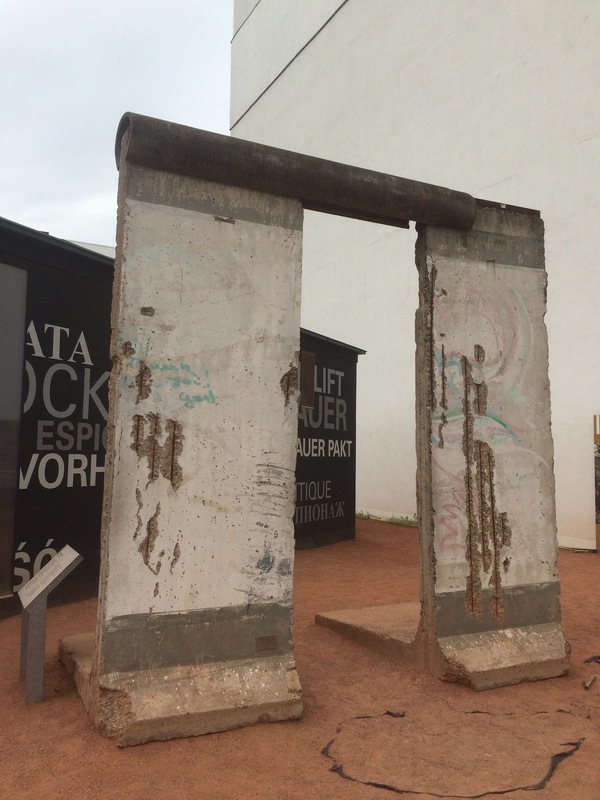 They actually had a really cool free exhibit with history about the wall and Cold War Berlin. We learned a lot. 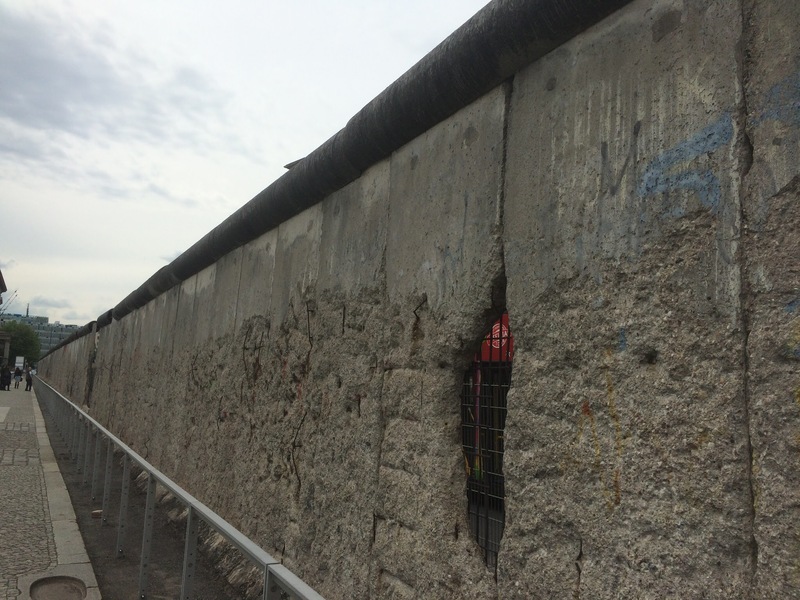 From there we saw a large remaining section of the wall that has been preserved. I amsaying goodbye to you before I die. We would so love to live, but they won’t let us and we will die. I am so scared of this death, because the small children are thrown alive into the pit. Goodbye forever. I kiss you tenderly. 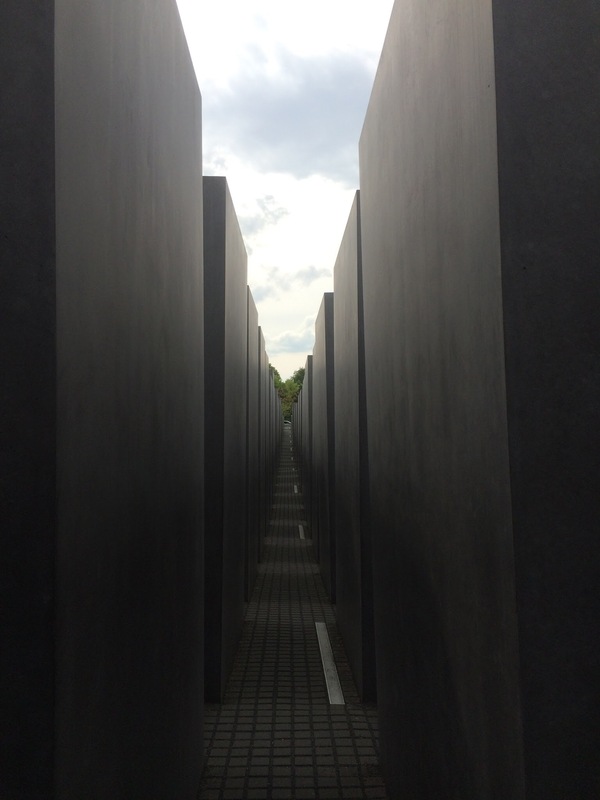 The memorial is haunting and makes you feel the weight of the history by reinforcing the fact that each of these 6 million victims had a story, a history, and a family. 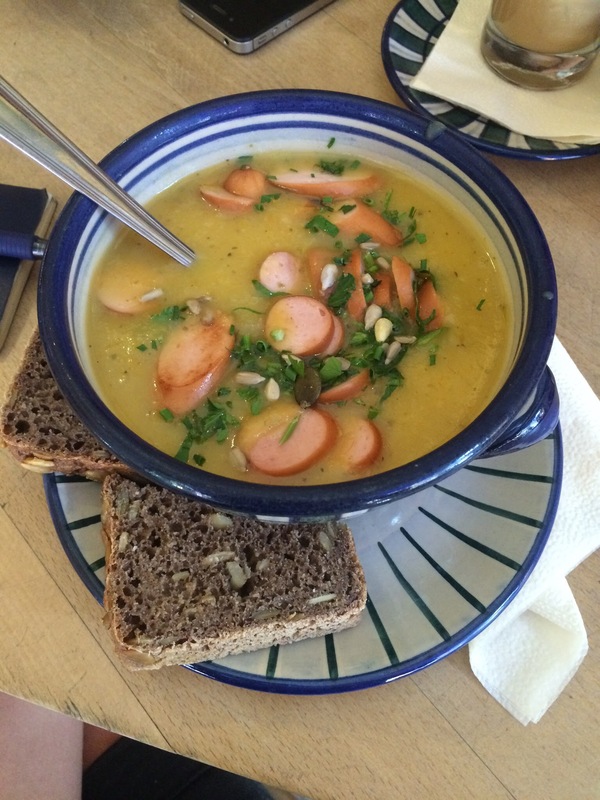 We spent the evening making curried turkey (oops we don’t read German very well…) with our awesome hosts Enrico and Samantha who we had met earlier in the week at a campsite. We had a great time staying with them and hope to see them again someday! The next day we said goodbye to our hosts and set out to find Knopke’s Currywurst for lunch (we had tried previously and ended up at the wrong place. 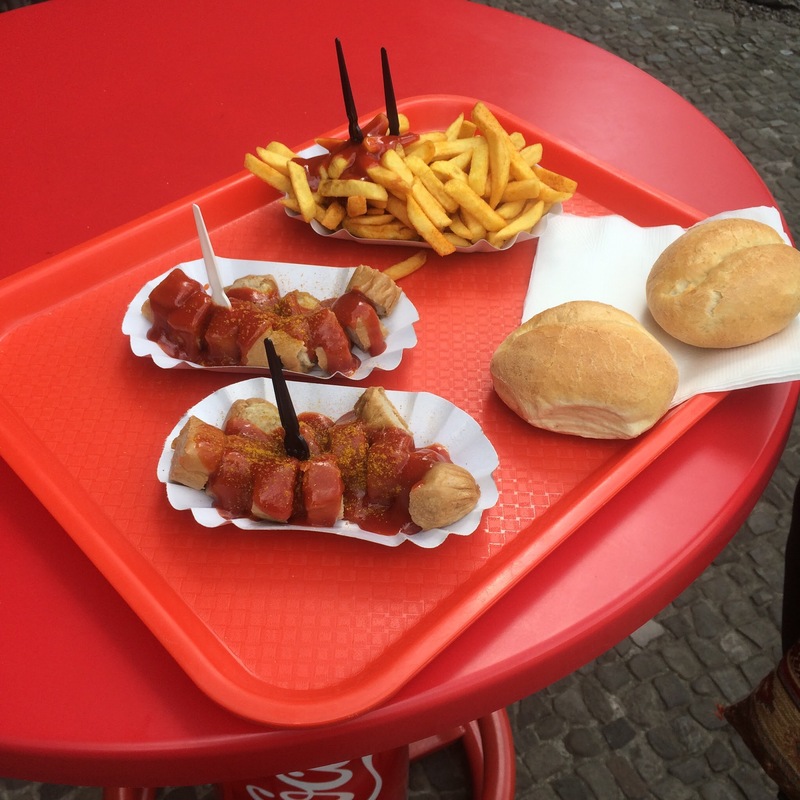 The currywurst was not as curry flavored as we had expected but was still good. 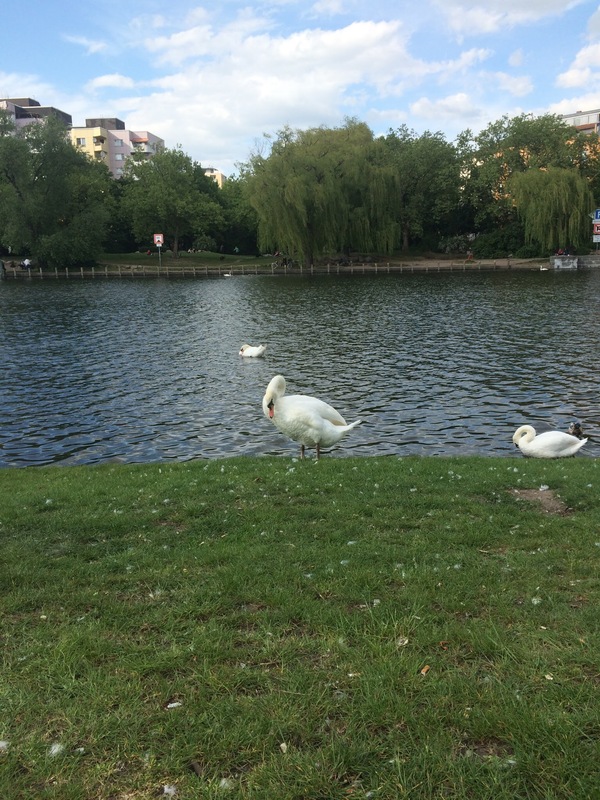 We spent the afternoon in Friedrichshain and Kreuzberg again just walking around.We were a bit late getting back to the apartment to grab our stuff and trying to catch our bus was really stressful. We made it with 2 minutes to spare and luckily were able to convince the driver that our bikes really would fit. The bus ride was pretty uneventful and we woke up at 6 am on the other side of the country. If you're enjoying reading our blog you can support it by donating below. Thank you! Please also e-mail us your address so we can send you a postcard!